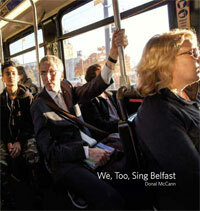 I don’t claim to be a person of great religious faith though I do believe in Belfast and its people. But I do admit to a huge respect and admiration for people of faith, not only because I believe those with strong spiritual and religious convictions can better cope with life’s trials and tribulations but also because when I negotiate the streets and roads less-travelled in our city, I meet the churches there. Providing shelter to the homeless, food parcels to the poor, comfort to the grieving and friendship to the lonely, the churches and faiths make both a spiritual and a practical impact on tens of thousands of lives in our city every day. That’s why my first engagement on the night of my appointment on 3 June was with church activists and leaders working at the very coalface of peace and change in North Belfast. At that meeting, I was encouraged by the willingness of these frontline bridge-builders to do more with the mayor to build Belfast. From that meeting, the idea for having a chaplain from all our main faiths was born. 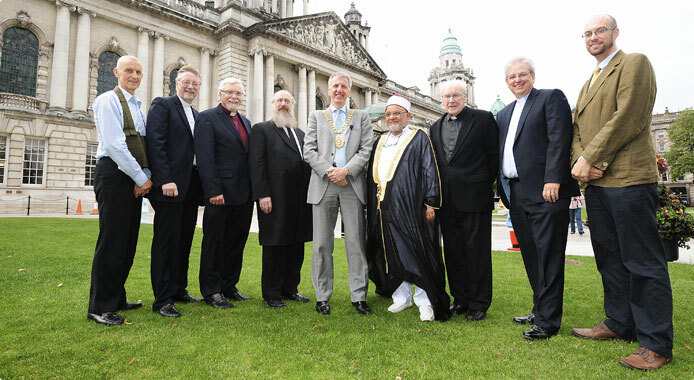 And by extending the invitation to appoint a chaplain beyond the main Christian churches to the minority faiths in Belfast, I also had an opportunity to celebrate the diversity of Belfast. While previous lord mayors of Belfast have had tremendous chaplains, they were tasked only with saying the grace at the installation dinner. The chaplains I am appointing from right across the city and representing the main Christian denominations but also the Buddhists, the Bahá’ís, the Muslims and the Jews, will work with me to build the peace and bring our peoples together. In what was a first for Belfast, I brought to the parlour this week a gathering of church leaders and peace builders. We discussed the practical steps we could take to reduce tension in the city, urge our political leaders to act in a spirit of generosity, and help reconciliation. And A Prayer for Belfast, an idea of Methodist President Rev Heather Morris, created by the Christian churches of Belfast was read, along with adaptations of the prayer by Rabbi Singer, Ryushin Paul Haller and Sheikh Mohammed El Rashidi (all three of whom will serve as my chaplains alongside Fr Des Wilson, Rev Harold Agnew and nominees from the Presbyterian, Church of Ireland and Bahá’í faiths). It was a moment of beauty and grace, a small step towards the unity of our city and of our people. At the opening of the meeting, 88-year-old Fr Des (who baptised all my children in his kitchen) introduced himself as “one of the Ancient Irish”. He referenced the beauty of the motto of Belfast which comes from a prayer, Pro Tanto Quid Retribaumus (For all that we have received, how shall we repay), and called for a celebration where the city would thank all those in our ethnic minorities for giving so much to Belfast. I hope to do just that on 29 September when Belfast Day on the lawn of City Hall (the day after my installation gala) will celebrate the wondrous diversity of our city. Put the date in your diary. God of love whose love streams unceasingly and relentlessly to all, we cry to you for our city. We pray for peace on our streets, for economic well-being, for understanding across our differences. Build us as one community, though diverse, that being reconciled to you we might be reconciled to one another. In the name of Jesus, who is Lord of all. Prayer for the People of the City of Belfast and its Leaders. עֵץ חַיִים הִיא לַמַּחֲזִיקִים בָּהּ וְתֹמְכֶיהָ מְאֻשָּׁר. דְּרָכֶיהָ דַּרְכֵי נֹעַם וְכָל נְתִיבוֹתֶיהָ שָׁלוֹם. יְהִי רָצֹו­­ן מִלְּפָנֶיךָ יְיָ אֱ-לֹהֵינוּ וֵא-לֹהֵי אֲבֹותֵינוּ שֶׁתִּתְמַלֵא רַחֲמִים עָלֵינוּ, וַעֲשֵׂה לְמַעַן אֲבֹותֵינוּ הַקְּדֹושִׁים, לְבַטֵל מֵעָלֵינוּ כָּל גְּזֵירֹות קָשׁוֹת וְרָעֹות וּבְצֵל כְּנָפֶיךָ תַּסְתִירֵנוּ. שָׁמְרֵנוּ מִכָּל צָרָה וּמִכָּל פַּחַד וּמִכָּל חֹלִי, וְנִהְיֶה מְיוּשָׁבִים בְּדַעְתֵּנוּ. It is a tree of life to those who cleave to it, and happy are those who support it. Its ways are ways of pleasantness and all its paths are peace. May it be Your will, Eternal, our God and God of our Forefathers, that You show us compassion and act for the sake of our holy Forefathers, to cancel all harsh and evil decrees against us and shelter us in the shadow of Thy wings. Protect us against any adversity, fright or illness so that we may have tranquility in our minds. Heavenly Father, bestow in the hearts of the advisors and leaders of the community a spirit of wisdom and understanding to maintain peace and the welfare of all the people and to act in kindness and truth will all who dwell within; and let us say, Amen. A Dhia na páirte, agus do ghrá ina thuile gan stad gan staonadh orainn, glaoimid ort ar son na cathrach s’againn. Iarraimid ciúnas sráide, folláine tís, tuigse don chomharsa, ainneoin a raibh eadrainn. Aon phobal amháin muid, más éagsúil, agus in athmhuintearas leat bímis muinteartha dá chéile. A Thiarna, dírigh ár gcroíthe ort le go mairfeadh do ghlóir fud fad an bhaile.